Toufic El Achkar returned to Bazbina on 25th May 2009 to attend the burial ceremony of his mother, Adibeh Chahda, who passed away in Houston on 22nd May 2009. She lived for 85 years of continuous strive and hard work. 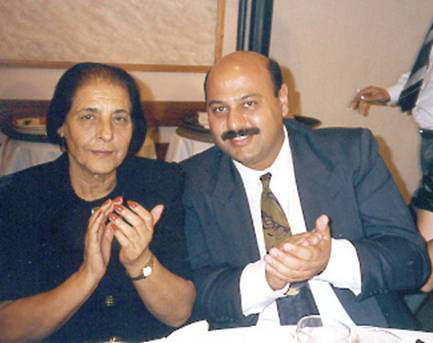 She was known to everyone as Maalmeh Adibeh (Teacher Adibeh) as she used to be a teacher and the principal of the school in Bazbina for decades. Adibeh, God bless her soul, was loved and respected by everyone in the village and, likewise, she tremendously loved all. 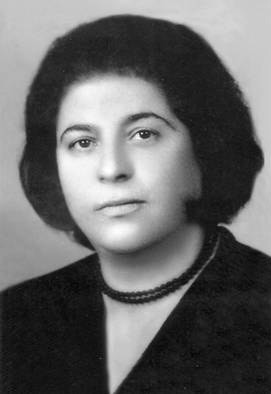 Under her patronage several social associations were established in Bazbina. In the attached documents, there are some pictures and the eulogy that Toufic delivered in the Church of St. Georges in Bazbina during the burial ceremony. 1- Photos of Abibeh Chahda and Family. 2- Eulogy to Adibeh by Toufic (Arabic). 3- Eulogy to Adibeh by Toufic (English). 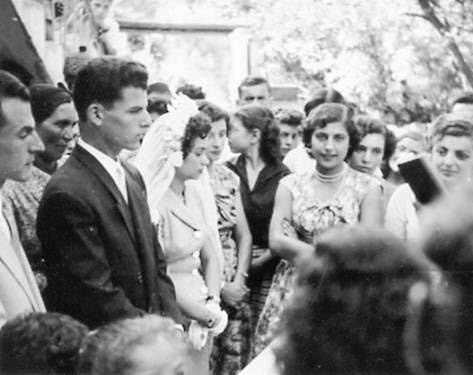 Adibeh Chahda at the wedding ceremony of Anwar Moussa and Georgette Hanna Saneh that took place at the front yard of Hanna Saneh’s house in Summer of 1957. 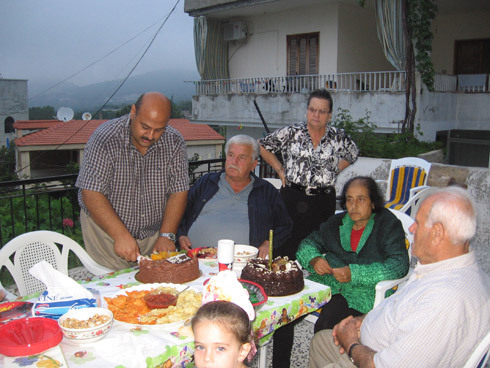 The picture shows (L to R) Jergis Moussa, Bashira Bitar mother of Faraj Moussa, Anwar, Georgette, Aurora Saneh, Slaiman Salloum Saneh, Adibeh, Rahmeh Moussa, Mary Hazim and the Bible being read by Priest Ibrahim Nassar (not shown). 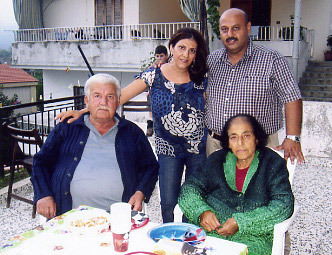 L to R: Is’hak Chahda, Toufic and wife Ra’fatte with Adibeh in Bazbina July 2008. Celebrating 3 birthdays at the same time: Is’hak Chahda July 5, 1933. Adibeh Chahda July 1924. Nazih Bahsa July 6, 1932. Also, Toufic’s twins, George and Adeebee, were born July 5, 2003. Toufic bought 5 cakes and cut. Bazbina July 7, 2008.